Product #18456 | SKU P-V257 | 0.0 (no ratings yet) Thanks for your rating! 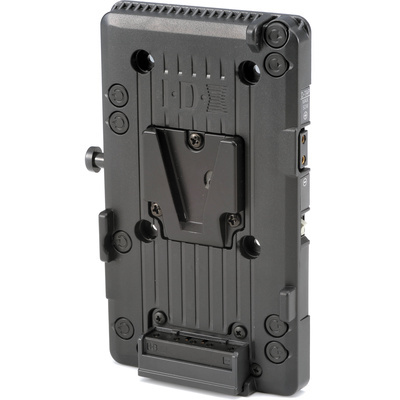 The IDX P-V257 Endura V-Mount Plate is a 2-pin D-tap DC Out and DigiView plate that is an enhanced variation of the P-V2 Plate series. Providing an ideal solution for combining Endura V-Mount batteries to handheld cameras without the standard V-Mount style battery lock, the plate offers precise DC power connectivity. For camera systems compliant with DigiView, the remaining battery power can be displayed in the viewfinder. Converting 12VDC power, the plate uses 1 tap for regulated 5V/7.3V (switchable). The second D-tap offers 50W (max) unregulated battery throughput for equipment such as lights and HDD recorders. You can use the Endura V-Mount Plate for a variety of cameras using the optional IDX cables specific to the camera models. The maximum power output available from the plate is 50W, and it measures 3.25 x 5.59 x 0.47" and weighs 0.40 lb.